There are just about as many different types of easels out there as there are different types of artists. How do you choose the right one for your work? 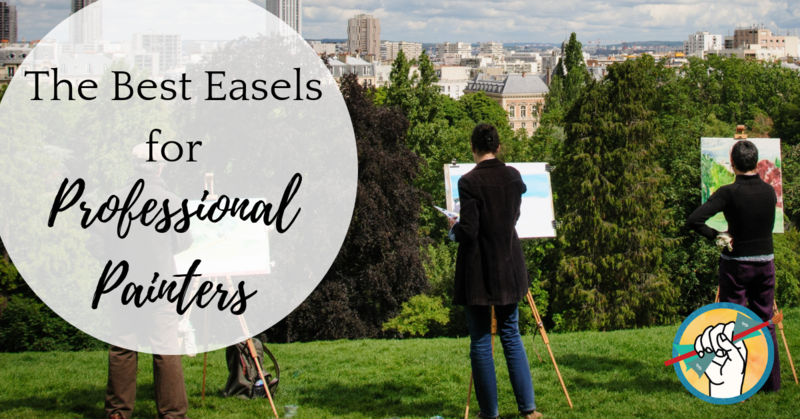 We sourced good recommendations from the professional artists in The Abundant Artist Association and put together a list of the best easels for artists, whether you’re an experienced professional or just starting out. A tabletop easel is a great option for artists working without a dedicated studio space. If you need to be able to quickly set up and work at the kitchen table, a foldable easel like the *Martin Angelina Aluminum Tabletop Easel is a good choice. It also features extra wings that swivel out to support your artwork, and -genius- rubber feet for extra stability. Best for small works, traveling, working outside of a dedicated studio, and can also be used for displaying finished art. Best for displaying various sizes of finished artwork. An H-frame easel is the heavy-duty, all-purpose cousin of the standard A-frame design, and a very common choice among professional artists. The H-shaped frame provides much better support across the entire canvas, so you can paint or make marks with as much enthusiasm as you want without worrying about knocking your work off the easel. If you work in multiple medias or desire flexibility, H-frames are often highly adjustable and can convert from vertical to horizontal. 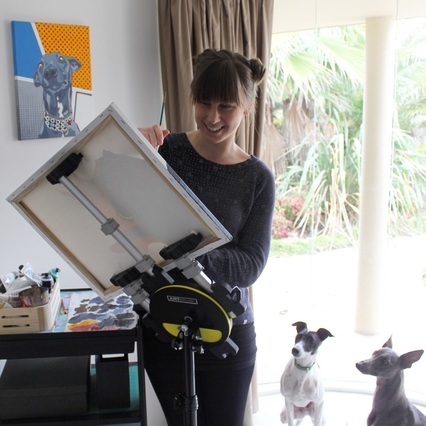 Association member Phyllis Green recommends the *Creative Mark Mirage All Media Studio Easel. Another convertible H-frame option with good reviews amongst Association members is the *Jack Richeson Best Deluxe Lobo Wood Easel. Best for All media, artists who need a high level of flexibility or like to move their easel around the space- even outside! Also called an A-frame easel, the lyre easel is a popular choice for casual painters. The rear leg usually folds in for easy storage, and they come in a wide range of sizes from floor to tabletop. The caveat is that they tend not to be as sturdy as an H-frame, there is less support for the painting, and they may not be as adjustable or convertible. These are great for hobbyists and beginners because of the folding style and low price point. A good choice is this *Adjustable Wood Travel Easel by US Art Supply. Best for hobbyists, portability, tabletop painting. If you paint frequently and want an all-in-one option, a French-style easel will be really appealing. What starts out as a wooden art supply box can be opened up and the legs expanded to become a full-sized floor easel (or a tabletop easel) with built-in materials storage. French style easels tend to be very portable, making them ideal for artists working outside of a studio, whether that’s painting in the kitchen or doing plein air work. A popular choice is the *Tangkula Wooden French Easel. Best for plein air, working both in and out of a studio setting, painters and pastel artists. The primary difference between a Pochade box and a French style easel is the lack of legs on the former. Also known as plein air easels, they are meant to sit on the ground, in your lap, or on a table top. They fold up into a wooden supply case with a handle for very easy portability, so you can trek into the blue yonder and paint to your heart’s desire wherever you end up. 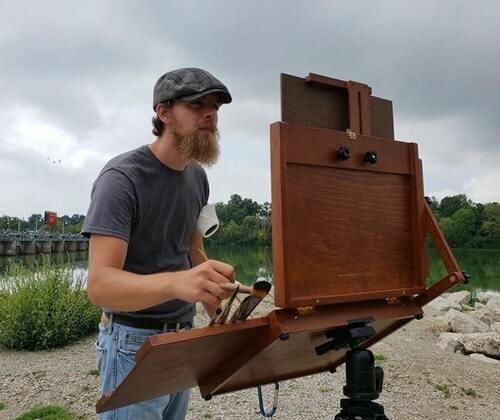 Association artist Nathan Brandner shared his favorite with us: the *Sienna Plein Air Artist Pochade Box. Nathan was kind enough to share an image of his Pochade box in action! In this photo he has his easel mounted on a tripod so he can work standing up. Best for plein air painting, super portable. Whether you’re a beginner ready to get away from hunching over the table, or you’re a pro ready to upgrade to something that will better support your workflow and habits, there’s an easel out there for you. Did we leave out your favorite style or brand of easel? Let us know in the comments! Not very exciting, here’s the one Ive been using for 20 years. It’s a Frank Herring easel made in the UK. It’s portable and stable and strong. I’ve used an aluminum Stan-rite easel since 1999. I like how it folds up if I need to travel with it. For studio work I currently use a Best Classic Dulce Easel. Here: https://www.madisonartshop.com/beeacldu.html. It is a good easel, but not ideal for smaller paintings if you stand up and paint, as the horizontal support only will go up part way. If you are on a tight budget, recommend the Mabef M-29 for plein air work, and it can work in the studio too. They are close to $50. For a French easel, I don’t recommend any of the after market brands. Go with a Jullian easel or Mabef. These have been around a long time and will hold up well.